Good Shepherd is an organisation working to help women and children in particular who are in need. 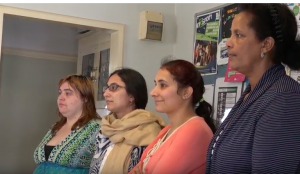 The organisation runs many programs for women to help build their skills among other things at their community house in St. Albans. One of these is the Sew Much More sewing class. The Sew Much More documentary series uncovers the stories of the four women completing the sewing class, who have each experienced great hardships, as well as the tutors and organisers behind it, through four micro-documentaries and one, longer form piece. The documentary series uncovers the benefit the class has had on these women beyond the simple sewing skills they have acquired, and how a sewing class can be sew much more than just a sewing class.